The book's English cover, featuring Lucina. The Art of Fire Emblem Awakening (Japanese: ファイアーエムブレム 覚醒 設定資料集 Knights of Iris Fire Emblem Awakening Model Sheets Knights of Iris) is an art and design book featuring Fire Emblem Awakening. It includes concept artwork and official artwork for many characters and classes. The contents of this page are primarily based on the English release published by Dark Horse. The Japanese print is a softcover book, while the English print is hardcover. The English print totals at 320 pages. The Sumia and Lissa piece, which was also featured on an e-Shop points card. This section features official artwork for Awakening's entire playable cast plus Validar, some full page story-event illustrations (Specifically, Sumia and a pegasus, Naga, and Chrom with an infant Lucina) and some of the Downloadable content artwork. It also features some miscellaneous artwork (specifically Tiki and Nowi stargazing, artwork of Grima, and artwork of Lissa fixing Sumia's hair). The 'Tiki and Nowi' and 'Sumia and Lissa' pieces were featured on e-Shop points cards in Japan. As the book was released before Awakening's DLC schedule ended, it does not include all of the artwork created for said DLC. Specifically, the artworks for Palla, Catria, Est, and Katarina are not in the book in any printing. The book is missing concept art for the Sorcerer class in all releases. The Fell Brand possessed by Robin is called the "Brand of the Defile" in the book's translated concept notes. A section covering Dangeki's favorite character poll, also featuring comments from people who participated in the poll. There are also some humorous comics featured in the section. The character profiles, somewhat disappointingly, consist simply of each character's roster description from the barracks. The profiles feature character portraits from Awakening and their alternate expressions. Non playable characters, like generic villagers and minor bosses, have brief descriptions mentioning what chapter they appear in and their personality. Class profiles consist of their flavor text, though slightly reworded. Artwork of Nowi and Gregor from the Background website. There is a page dedicated to the extra artwork featured on Awakening's Background website. The book does not mention that said website is the Japanese one, which may confuse some readers, as this artwork is not featured on any official English websites. The page also does not feature all of the Background website's artwork, missing the pieces featuring Gangrel and Aversa, Olivia and Mustafa, Grima and Robin, and Tharja and Robin. The next couple pages consist of the Einherjar cards, in other words, it features the cropped artwork of the bonus spotPass characters. 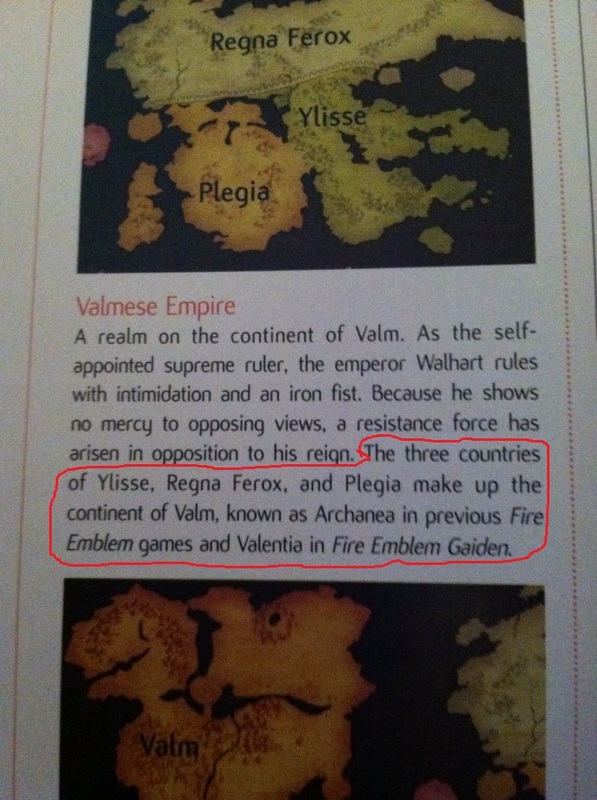 The book incorrectly claims in its glossary section that Ylisse, Ferox, and Plegia are all a part of Valm, and that Valm was once known under the (incorrect) name Archanea and the (correct) name Valentia, claiming that those two continents were the same one but called Archanea in "previous Fire Emblem games" and Valentia in Gaiden. This error is not in the Japanese print. The glossary entry for the Deadlords marks the first use of the term "Twelve Crusaders" in any English-localized Fire Emblem series materials. The book compares the Twelve Deadlords, also mentioning their Fire Emblem: Genealogy of the Holy War appearance, to the Twelve Crusaders and mentions that they are said to be connected. Section 5 concludes with one page dedicated to listing the credits of Awakening. A compilation of all the support conversation scripts in Awakening. This is the book's largest section, comprising 103 pages of (very small print) text. Awakening's support conversations are also archived here on-wiki. Scattered throughout the book on various pages are snippets of character dialogue. In the Humorous and Strange Dialogue section, specifically on page 184, a quote discussing Nah's strange name is erroneously cited as being from paralogue 15, Noire's recruitment paralogue, Nah's paralogue, and the correct paralogue to cite in this instance, is paralogue 16. This is the table of contents provided within the English print of book itself. (unofficial) Fire Emblem Awakening Model Sheets Knights of Ylisse Some fan articles change Iris to Ylisse to align with Awakening's localization. Japanese ファイアーエムブレム 覚醒 設定資料集 Knights of Iris Fire Emblem Awakening Model Sheets Knights of Iris. "Iris" is the name of Ylisse in the Japanese version. Sample concept sheet of Chrom's designs. Sample concept sheet of the avatar's designs. Sample concept sheet of Walhart's designs.